The Movement of Rank and File Educators is proud to welcome fellow educators from Oaxaca, Mexico to New York City. The Oaxacan teachers union has been at the center of a broad-based movement for educational and social justice in Mexico. Last year Oaxaca was the center of violent clashes and police repression as teachers mobilized to resist neoliberal education reforms. They have long been campaigning against privatization, police repression, corruption among the union leadership. The organization now finds itself at the forefront of mobilizations for earthquake relief. 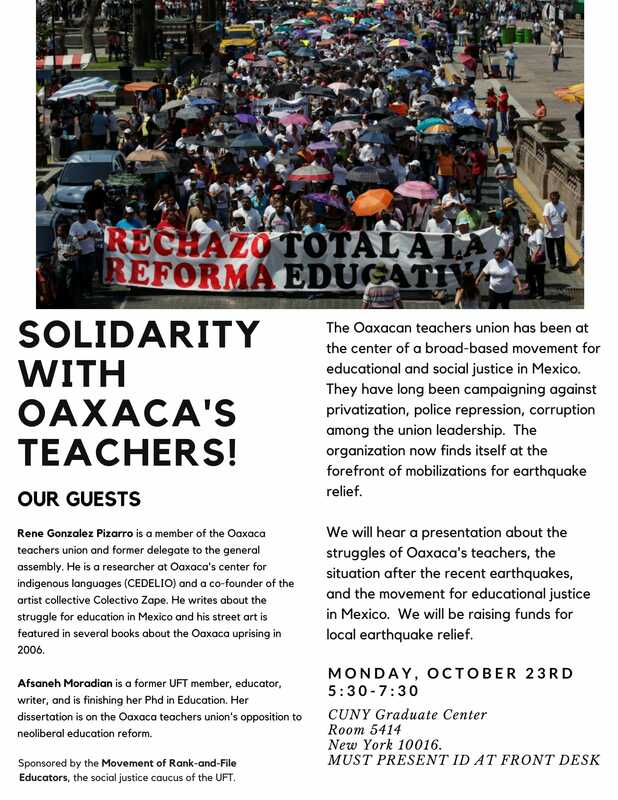 We will hear a presentation about the struggles of Oaxaca’s teachers, the situation after the recent earthquakes, and the movement for educational justice in Mexico. We will be raising funds for local earthquake relief. This is a public event, all are welcome. Rene Gonzalez Pizarro is a member of the Oaxaca teachers union and former delegate to the general assembly. He is a researcher at Oaxaca’s center for indigenous languages (CEDELIO) and a co-founder of the artist collective Colectivo Zape. He writes about the struggle for education in Mexico and his street art is featured in several books about the Oaxaca uprising in 2006. Afsaneh Moradian is a former UFT member, educator, writer, and is finishing her Phd in Education. Her dissertation is on the Oaxaca teachers union’s opposition to neoliberal education reform.